Whether you want to help a child walk properly again after a broken leg, teach patients with Parkinson's to be safe by focusing on their balance, or enable an athlete to smash all the records, St. Ambrose University's Doctor of Physical Therapy (DPT) program will train you how to improve the quality of people's lives. Our graduates work in hospitals, private practices, outpatient clinics, sports centers, and the armed services. Our rigorous curriculum bridges both theory and practice to produce top-notch physical therapists. You’ll gain skills in a variety of clinical practice settings and have the option to explore specialty areas of interest. Offered by a team of students and faculty from the departments of Nursing, Occupational Therapy, Physical Therapy, Social Work, and Speech-Language Pathology. What makes the DPT program at SAU unique? 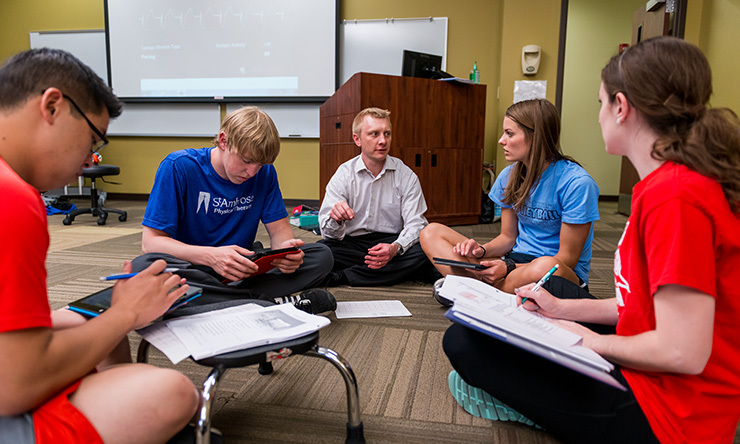 At SAU, you benefit from small classes – an average of 36 students – which is smaller than most DPT programs. This allows our faculty to give you more personal attention and guidance. We focus your education on evidence-based practice. Here, it is a constant topic and integrated throughout the DPT curriculum. Each year, the SAU Physical Therapy Department hosts an Evidence-Based Practice Symposium where you can build on your knowledge and network with peers and experts in the field. TeamSTEPPS training. 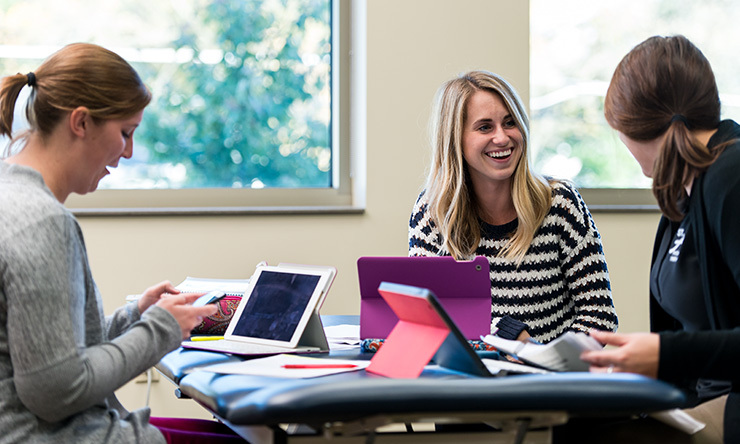 We bring our physical therapy, occupational therapy, speech-language pathology and nursing students together to complete interactive learning experiences and to learn from faculty across different departments. Interdisciplinary Day. Each year students in the physical therapy, occupational therapy, social work, nursing, and speech-language pathology programs spend a day working through a patient scenario and addressing every aspect of patient care. Students work in teams to tackle the case, and each team includes a representative of each program. Interprofessional Health Clinic. This clinic provides student-led interprofessional healthcare services to underserved populations with a focus on compassionate care, empowerment of the individual, management of health conditions, and overall wellness. Want to learn more? Watch this video about the Interprofessional Health Clinic. Read about our Institute for Person-Centered Care (IPCC) at St. Ambrose. You'll get 1,400 hours of patient care experience in the clinical education program, working at seven sites for 35 weeks. SAU has established relationships with more than 400 clinical sites across the U.S., including general and specialized practice settings. We offer three tracks of admission. Up to 36 students are admitted into the DPT program each fall. Track I is exclusively for high school seniors planning to enroll at SAU. Each year, up to 15 high school seniors are granted placement in Track I positions conditionally reserving them a place in the DPT class that begins during their senior year at SAU. Individuals interested in Track II or Track III must submit applications through the Physical Therapist Centralized Application Service at www.ptcas.org. Students wanting to pursue a degree in physical therapy come from several different majors, the most popular being Exercise Science, Human Performance and Fitness, Sport Management, Psychology, and Biology. Certainly, other majors also pair well with Physical Therapy; it's important to talk about these options with your advisor. Note: Beginning with Fall semester 2017, St. Ambrose University Physical Therapy Department will not accept online lab courses to satisfy prerequisite requirements. All lab courses must be taken on campus. *At SAU, human physiology is combined with anatomy in a two-semester sequence of courses with labs. A human physiology course with labs fulfills this requirement. **At SAU, any upper level psychology/sociology will meet this requirement. PSYCH 255 Brain and Behavior is strongly recommended. CLEP Policy: The Physical Therapy Department will follow guidelines set forth by the St. Ambrose University Office of the Registrar for accepting College-Level Examination Program (CLEP) exam results towards prerequisite courses. For example, students can take the psychology CLEP exam and receive course equivalent for PSYC 105. This would count as meeting one of our psychology prerequisites. While there is a CLEP exam for biology, the Registrar's policy is to only give the equivalent of BIOL 101, which we do not accept as a biology prerequisite. The full list of Course Equivalents for CLEP exam can be found here. 1 DPT 580 is a 2-week clinical held in early January. Other courses begin in Mid-January. 2Summer courses are held over six weeks from the end of May through June. DPT 582 is a 3-week clinical held after the rest of the courses. 3DPT 680 is a 2-week clinical held mid-semester. 4DPT 780 is a 2-week clinical held mid-semester. 5DPT 830 is a 1-week course held in May right after spring semester finals week. DPT 781 is an 8-week internship. 6DPT 782 is an 8-week internship and DPT 784 is a 10-week internship. 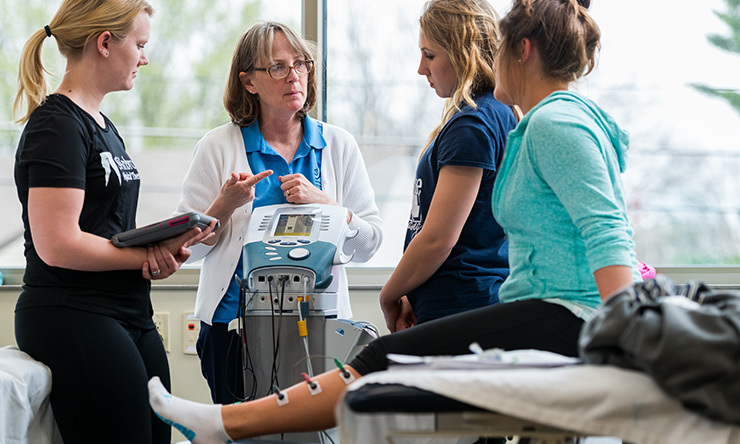 The St. Ambrose University Doctor of Physical Therapy (DPT) Program sets a One-Price Tuition for all tuition and fees for the full 2.5 years of the DPT Program. The total cost of the program is then divided across seven payments and the cost will not change over the course of the program. This format ensures that the student knows the total tuition costs and can plan accordingly. This set price includes all tuition, course fees, liability insurance, technology fees, graduation application fees and a physical therapist tool kit that is used throughout the curriculum. Additional costs are not included in the One-Price Tuition Plan because they may vary based on the student's prior training, clinical site placement, and decisions on what course supplies to purchase. Starting in Fall 2020, Track I and II students will not be able to apply any undergraduate scholarships awarded from St. Ambrose University to tuition and fees associated with the first year in the DPT Program. That includes athletic scholarships and funding through the faculty/staff tuition remission and exchange programs. Other state or federal grants and private scholarships could still apply during the first year in the DPT Program. Those students accepted into Track I will still be able to use scholarships during their first three years at St. Ambrose University. Safely and efficiently analyze an existing or potential movement dysfunction. Analyze functional capabilities of the movement system, including: the assessment of cognitive/mental status, vital signs, skin and vascular integrity, wound status, endurance, segmental length, girth and volume, sensation, strength, tone, reflexes, movement patterns, coordination, balance, developmental stage, soft tissue, joint motion/play, cranial and peripheral nerve function, posture, gait, functional abilities, assistive device fit/use, and the cardiopulmonary system. Develop and document a plan of care for a patient that considers the psychosocial impact of the dysfunction or disability and integrates the needs of both the patient and the family. Demonstrate management skills and the ability to work as a member of a multi-disciplinary team, including through the TeamSTEPPS approach. Team Strategies and Tools to Enhance Performance and Patient Safety (TeamSTEPPS) is a program designed to build strong healthcare teams, improve quality of care, and decrease medical errors. It's built around four teaching skills: communication, leadership, mutual support, and situation monitoring. The Human Movement Lab is a research and education facility focused on the study of human biomechanics and motor control in health, aging, and disease. Research is conducted using state-of-the-art measurement techniques including kinematic, kinetic, and electromyographic analyses. Kelly Kersten, who graduated from St. Ambrose University in 2005, is currently employed as an Outpatient Orthopedic Physical Therapist at Rock Valley Physical Therapy. Tara DeWolfe, who graduated from St. Ambrose University in 2005, is a Pediatric Physical Therapist at Genesis Health Systems. Anthony Caronia, who graduated from St. Ambrose University in 2009, is giving back to St. Ambrose with his wife through the Anthony and Jennifer Caronia Scholarship. The St. Ambrose University Human Movement Studies Laboratory is a research and education facility focused on the study of human biomechanics and motor control in health, aging, and disease. Research is conducted using state-of-the-art measurement techniques including kinematic, kinetic, and electromyographic analyses. While Physical Therapy Department faculty manage the facility, it is the goal of those conducting research in the laboratory to collaborate with interested faculty from other departments across the university, as well as individuals in the community who may wish to participate. In addition, the laboratory exposes DPT students and undergraduates to advanced measurement systems and interaction with faculty researchers. The laboratory is located on the Genesis Medical Center West Campus, adjacent to the St. Ambrose University Center for Health Sciences Education. Take the next step to earning your doctorate and apply to the Doctor of Physical Therapy program.